Losing weight has always been at the forefront of people’s minds, which is probably one of the reasons that the Biggest Loser has resonated with so many people. However, there are realistic expectations set on the show, and usually, we see a 100 weight loss when the person is around 250 pounds to begin with. However, Rachel Frederickson has caused a massive controversy when she ended up revealing her incredibly slimmed-down figure, dropping more than a 150 pounds in a very short amount of time. 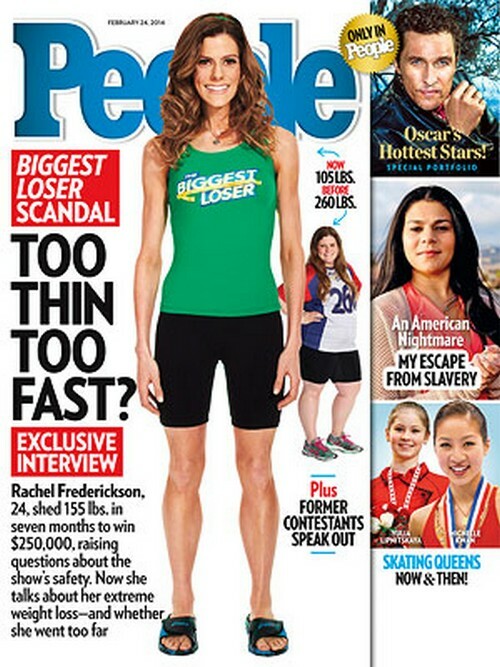 Rachel revealed her size on the Feb 4th finale of the show, and while she did win the title of the ‘Biggest Loser’, she also caused concern among viewers, fans, friends, and even former contestants. Her starting weight was around 260 pounds, and she’s now at an incredibly scary 105 pounds. With her height at 5’4”, her BMI chart would put her as ‘under weight’, which is definitely not in a good place to be in for someone who just lost 150 pounds. Being too skinny isn’t that much better than being too fat, but Rachel clearly didn’t get that memo. However, Rachel is clearing up rumors of an eating disorder in a new interview with People, and she also claims that her drastic weight loss was very sustainable. She claims that she did maintain a 1600-day calorie intake, coupled with working out six hours per day for three months non-stop. Well, the working out was definitely overdoing it, but that would still lead to her burning more calories than she was taking in. I suppose it’s believable, although I’m more inclined to believe that she went about this in an unhealthier manner. I mean, that’s about a 50-pound weight loss every month! People also has a feature on Oscar’s hottest stars this year around, which should be plenty packed considering we have nominees like Matthew McConaughey, Chiwetel Ejiofer, Michael Fassbender, Lupita Nyong’o, Jennifer Lawrence, Amy Adams, etc.